The Economist has praise for television's survival during a time of technological change. Fox Sports president Ed Goren is against streaming sporting events online, which he believes will cannibalize their money-making potential on TV. Carl Lindemann assesses the pros and cons of virtual sets for use by TV stations. Harry Jessell reports that affiliates, NBC's and others, are nervous about the NBCU-Comcast merger. Jeff Zucker might become a politician,and Oliver Stone's coming to TV. TV By the Numbers assesses the performances of all the freshmen network shows thus far. And Mediaweek's Alan Frutkin provides a video report on the season's winners and losers. Jim Louderback gives a personal example of how hard it is to count how many TVs are in a home (this in response to the recent Nielsen report). Nielsen will begin testing key changes to its local ratings measurement methods. Conan will be on 60 Minutes this Sunday; Bill Carter reveals what he'll discuss. James Poniewozik also reports. The mean age of the network news viewer is rising. Thursday night's fast nationals: CBS dominated a relatively tepid Thursday again. Forbes' Lacey Rose speaks with Family Guy producer Kara Vallow about animation, network standards and practices, censorship, and a possible Family Guy movie. The Supreme Court is considering whether or not to deal with Cablevision's challenge to the must-carry rules. Toby Young and Cornel Sandvoss tie the UK elections to reality TV and political satire, respectively. The online journal FlowTV will host its next conference in the fall, and the call for responses -- basically a list of questions Flow contributors proposed which could end up as roundtable discussion topics -- has been posted. Check it out if you'd like to participate or if you'd just like to see what's on TV studies scholars' minds these days. And if you happen to really like the one titled "Til Series Finale Do Us Part? Fan Commitment and the Long-running Series," well, let's just say you have very good taste. Last year it was sub sandwiches, this year it's flash mobs. The Austin Chronicle profiles Austin as the production home of Friday Night Lights. Jonah Weiner says the censored South Park episodes are genius, and seventeen Pulitzer Prize-winning editorial cartoonists have signed a petition condemning the threats against Parker and Stone. Joe Flint has some advice for Lifetime: "Perhaps Lifetime could stand out by trying to go after quality as opposed to schlock. Leave the shows about addictions, dating and dysfunction to everyone else and develop some shows that one doesn't have to be embarrassed about watching. There's nothing wrong with the occasional guilty pleasure, but it can't be the only thing on the menu." Peter Kafka finds that Hulu has done fine thus far without Colbert and The Daily Show on offer. As the network upfronts approach, you'll want to bookmark Broadcasting & Cable's Upfront Central website, with links to all their upfront coverage. Joe Mandese looks at how Nielsen has had to change definitions and methods of measurement due to technological developments. Wayne Friedman says that even in the DVR era, program lead-ins and on-air promotion are still key. Wednesday night's fast nationals: Idol won, Modern Family did well, Happy Town didn't. Survivor is the most-watched program in Canada. Will Richmond looks at how cord cutting could affect Comcast and Netflix. James Poniewozik highlights TV people who are part of Time's 100 Most Influential People list. Annie Stamell looks at what does and doesn't work in the online series Web Therapy in terms of its potential to work for Showtime. Linda Holmes explores why Community works. USA Today looks at the state of the networks as we enter May sweeps. Lengthy article from Bill Gurley about the role affiliate fees will continue to play in the digital age (plus he raises a bunch of other topics in connection, such as cable bundling, Hulu, and TV Everywhere). Les Moonves is not impressed by what he's seen of 3D TV, except for sports. Fox and CBS aren't expressing any concerns about the Comcast-NBCU merger. The number of sitcoms in network development is up over last fall. Predictors say the network upfront market will be up 20% over last year. In related news, Viacom reports that ad profits are up. TV By the Numbers has an intriguing ratings analysis of the gender balance of network shows, the vast majority of which lean female. Another blog has a similar list from last year. HBO's Treme has already been renewed, but with such low ratings that it's clear to TV By the Numbers that it wasn't ratings that drove the renewal (the article also analyzes the ratings for The Pacific). More ratings detail for Treme. The FTC has launched a media literacy website aimed at helping 8-12-year-olds understand and assess advertising. Amy Chozick looks at why TV shows are increasingly portraying teens and parents getting along. Nielsen figures show ad spending on cable was up 16% last year and on broadcasting was down 10%. A Hawaii outlet reports on the money Lost has brought to the state across its years filming there. Bravo's senior VP of original programming and development, Andy Cohen, says despite the channel's gay-friendly reputation, "We're bi. You don't know who we're gonna go home with at the end of the night." Myles McNutt looks at the latest Save Our Show campaigns and judges their chances of success. Excellent post from Amanda Ann Klein about the first episode of the last season of The Hills and its very real, very sad, portrayal of the Heidi-monster that it created. Gawker pleads with us not to watch: "Please join us in saying no to this awful, awful thing. Trust us when we say that we know it was silly to have ever watched in the first place. But it's gone past silly now. Something has tilted sideways and darkened. This is grim territory we are entering and rather than abandon all hope, we'd prefer to turn around and walk back up to higher ground." Comcast's CEO says ad sales are finally up again. The number of TVs in the home has increased, according to a Nielsen report: "This year the number of US homes with three or more TV sets increased to 55%, 28% have two sets and 17% have one set." NeeTeeVee reports on the findings, which include a 34% household DVR usage rate. And Aaron Barnhart reports. Rob Owen writes about the increase in shows focusing on senior citizens, a possible change in TV's younger demo obsession. Perhaps there's something to that; as Aaron Barnhart points out in connection with the recent Nielsen audience study, the percentage of 50+ viewers has grown. NAB President/CEO Gordon Smith told Senate committee members that broadcasting is still an important communications format, and broadband and broadcasting are not mutually exclusive. Tuesday night's fast nationals: CBS was solid with NCIS's return, but Idol was stronger and Glee held up. Fun Twitter thread going on: summarizing Lost in only 140 characters for those who haven't seen it, i.e. @ErikaJL: ppl w/daddy issues crash on mysterious island, timey-wimey insanity ensues, quips are made, nicknames given. Al Gore's Current cable channel will be moving toward something he's calling Crowdsourced TV. Joe Mandese reports, "During his speech, Gore implied that the next iteration of Current TV would expand on its users' ability to create information and entertainment content, as well as advertising on behalf of marketers and brands." Bloomberg reports that government regulators may demand that Comcast make concessions that would favor Web startups like Boxee and Roku after the NBCU merger in order to help foster a level playing field in online video. Matt Sienkiewicz analyzes the censored South Park episodes over at Antenna. Nearly 28,000 people have uploaded audition videos to MySpace in hopes of snagging a role on Glee, and over 85 million votes have been casts for those videos. Futon Critic has a cast picture and press release describing the Colombian adaptation of Grey's Anatomy, whose first episode earned a 48 share (!). In line with the telenovela format, A Corazón Abierto (With Open Heart), will run for 80 episodes. Talks have broken down between Hulu and British broadcasters, so there will be no Hulu UK in the foreseeable future. A consumer advocacy group has named Comcast the worst company in America, just edging out Ticketmaster. After trying other options, NBC is now returning to traditional upfronts. But Brian Steinberg says the network is still using some nontraditional measures. John Consoli also reports. Michael Newman has posted the paper he delivered at the recent Console-ing Passions conference, in which he defends the multi-camera sitcom. Newman writes, "The idea that single-camera comedies are an improvement on the traditional sit-com rests on some questionable assumptions about television history and aesthetics, which I wish to interrogate. Most importantly, I want to insist that if TV scholars are to turn to questions of aesthetics (which I think is a really good idea! ), we do so in a way that appreciates all of television history in aesthetic terms rather than just the most recent Quality TV that appeals to folks like us, and that we do so in a manner attentive to the cultural functions of aesthetic discourses." Jaime Weinman highlights problems with the commercial break-driven six-act structure currently undergirding many network drama hours these days. Richard Beckman, the man who will guide the Hollywood Reporter into the future, says of his plans for the new HR: "I want to create a product that is the crack—the drug crack—of the industry, whether it’s digitally or in print. I just ask that they be ­patient with us while we do it." Well, ok then. Who isn't willing to wait for crack? Asked about competing with Variety, he says, "If I’m setting the bar at where Variety is—and this is going to sound really caustic—I’m setting the bar too low." Monday night's fast nationals: Fox won the favored demo; ABC won total viewers. TV critic Maureen Ryan didn't enjoy Happy Town much, but her review is an innovative joy: a mock network memo summarizing the executive thinking she assumes went into programming the show. There are rumors that Samsung is working on a TV set that will incorporate the Google TV platform. CBS's venture into feature filmmaking isn't going well. Kevin Martin helped to dismantle conglomerate regulation when he was FCC chairman; now he's backing the forces fighting against Comcast-NBCU. One of the groups Martin is advising demands that Comcast carry more African-American-owned cable channels. Brooks Barnes introduces us to Sunset Daze, a WE tv reality show focused on retirees. Letterman unloaded on Jay Leno during an interview with Dr. Phil (naturally) last night. Scott Collins and Denise Martin present the songwriters' perspective on Glee. Futon Critic has an interview with Adam Divello, creator of The Hills and The City. The BBC is releasing a series of Doctor Who video games. Matt Martin reports, "Each episode is designed as a true extension of the hugely popular Saturday night TV show, with Sumo, BBC Wales Interactive and BBC Online collaborating with Broken Sword designer Charles Cecil to create what it calls 'new forms of drama.'" Martin also interviewed Sumo's studio head about the game development process. Friday Night Lights will return to NBC soon, and David Carr profiles the show. John Ourand and Michael Smith detail how the new NCAA basketball championship TV deal developed, Wayne Friedman says sports mostly already are on cable (read it to see what he means), and Robert Seidman questions the assumption that sports on cable automatically leads to higher cable rates, which encourages some productive comments section discussion (as far as such a thing can actually exist). David Goetzl analyzes post-paywall Variety's page views. You can now search for specific TV episodes via Google. Like I said, Southland renewed. Multichannel News talks with A&E Television Networks CEO Abbe Raven about the struggles of Lifetime, History re-branding, A&E demographics, and VOD possibilities. UPDATE: Lifetime has a new president, borrowed from History. MIT researchers look at the relationship between TV and social media. TBS is running another microseries, a short episodic series with product placement run in place of a traditional ad break. Alex Weprin reports, "The microseries will premiere during Tyler Perry's Meet The Browns April 28. Two new episodes will air every Wednesday for five weeks, and will be available online after their airings." Dish Network and DirecTV are fighting yet again about HD claims yet again. Nielsen may be going public again. Claire Atkinson considers what this might mean. Mediaweek offers a special report on what the upfronts for children's programming tell us about the state of cartoons, marketing, food and health issues, and the psychology of design. The A.V. Club has a cliptastic list of 21 failed backdoor pilots. Halfway through his analysis of broadcast network programming trends over the past five years, Cory Barker today offers a look at Fox (previously he looked at CBS and ABC). B&C previews TruTV's upfront presentation coming tomorrow. B&C interviews Hasbro Studios president Stephen Davis about integrating toys into a TV network. B&C's Marisa Guthrie analyzes the struggling yet dogged survival of the broadcast network model. Ed Martin looks at the lessons of Glee for the TV industry. NYT's Stephen Castle reports on the impact that televised debates have had on the British political process. America's Got Talent is now soliciting auditions via YouTube. Josef Adalian claims that Rob Lowe was added to the cast of Parks and Recreation at NBC's behest in order to goose ratings next season. Virginia Heffernan analyzes tweeting about Lost. Food Network's new spinoff Cooking Channel is launching in stages. 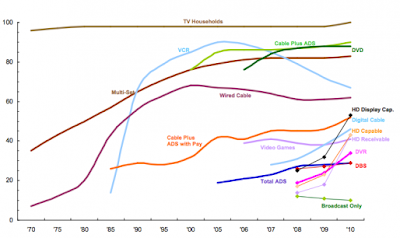 My latest biweekly update on media industry news is up at Antenna. "Sweatin' Out the Shame" by Lucas Hilderbrand: A look at classic VHS workout tapes. "What Big Ambitions You Have! : ABC's 1965 Revision of 'Little Red Riding Hood'" by Quinn Miller: An examination of "The Dangerous Christmas of Red Riding Hood? or Oh Wolf, Poor Wolf" and its role in the camp sensibility emerging within U.S. media culture in the mid-1960s. "Introduction to Oogabooga Studies" by David Parry: As a follow-up to discussions of the "new" and "media" aspects of "new media" studies, Parry proposes the name "Oogabooga Studies" to ameliorate the overuse of the phrase "new media." "The Return of the Digital Native: Interfaces, Access and Racial Difference in District 9" by Kevin Hamilton and Lisa Nakamura: An analysis of "digital natives" and similar representations within science fiction films. "An Empty Set" by Megan Sutherland: A consideration of theoretical applications to the apparatus of television against the presence of cable signal frequency. "Tiger! Tiger! Burning Bright" by David L. Andrews: A look at the (crumbling) star identity of Tiger Woods. "Bing: An Illiterate Cure for Search Overload" by Daren C. Brabham and Annie Brabham: A consideration of how the search engine Bing "decides" for its users. Friday night's fast nationals: good news for NBC. At Antenna, Derek Kompare writes about the cross-generational, cross-genre, whimsical appeal of Doctor Who, the likes of which doesn't exist on American television. Lisa Kudrow's online series Web Therapy has been picked up by Showtime; will many others follow? Deborah Potter writes about the disappearance of the package on local TV news. Just came across this striking infographic breaking down how the 2008-09 BBC budget was allocated across various categories. You can also see the data in spreadsheet form. Brian Stelter reports on Jon Stewart's relentless focus on Fox News. Fox News has a transcript of O'Reilly and Goldberg responding. Nielsen says video game playing during prime time has impacted network ratings. CNN catalogs an array of reactions among Muslims to the South Park controversy. Commenter rvaen offers a link in the comments that I'll also highlight here: a rousing defense of Parker and Stone's intents from Salon's Mary Elizabeth Williams. Laurie Sullivan writes about Nickelodeon's so-called one-brand strategy to define the network. More reaction to Hulu's subscription plan: this is coming too late; its potential for success is up in the air; this is exactly what Hulu needs to do. Presentations from last month's Transmedia, Hollywood: S/Telling the Story symposium ("a one-day public symposium exploring the role of transmedia franchises in today's entertainment industries") hosted by Henry Jenkins and Denise Mann are now online. Thursday night's fast nationals: CBS carried the night, but ratings overall were down likely due to NFL draft coverage on cable. John Ourand tweeted: Draft ratings off the charts. ESPN's 5.4 metered-market rating is +26% from last year. NFL Net's 0.95 metered-market rating is +44%...Another example why NFL is king: ESPN draft coverage pulls 5.4 metered-market rating. TNT NBA playoffs was a 2.1." It's been the subject of a million articles already, but anything by James Poniewozik is worth reading, so here's his latest on CNN's ratings struggle and an ingenious suggested solution: "CNN should focus not on both-handedness but on truth. It should let the chips fall where they may, not make sure that the chips, over time, aggregate around the middle. The slogan for my ideal CNN — or any news outlet — would be "The news: whether you like it or not."" The amount of U.S. programming airing on Canadian TV is spiking. Jay Leno's ratings are starting to fall, putting him on a path that TV By the Numbers observes is quite similar to Conan's. The Atlantic has resurrected a clip of James Dean and Ronald Reagan in a scene from General Electric Theater. I'm late to this one, but it's worth catching up with: New York Magazine's predicted timeline of the Glee blacklash. James Poniewozik writes about media companies attempting self-criticism. A group of reality TV producers gathered yesterday for a panel called Unscripted on Cable: The State of the Business, and Mediaweek has a video excerpt. Wayne Friedman pinpoints daytime as the daypart battleground cable will next try to fight broadcasting on. The new TV contract for NCAA tournament basketball will give broadcast rights to CBS and Turner (TBS, TNT and truTV), pushing the Final Four to cable television every other year starting in 2016. Further, the field will be expanded to 68 teams next year. JB Flint also reports, and adds the note that Turner will likely use this to try and jack up its channels' carriage fees, especially for truTV. And Brian Sternberg explains why this change is happening. More analysis from the AP. Harry Jessell sees this as a big blow to broadcasting. Matthew Belloni reports on the brewing controversy over HBO's Tilda, whose script only thinly veils its apparent subject, Deadline's Nikki Finke. Wednesday night's fast nationals: "Idol Gives Back" won against mostly repeats. Frito-Lay will run a national ad spot for Sun Chips that was created by a Current viewer for a contest. Media Life talks to David Scardino, an agency entertainment specialist, about DVR time-shifting and the state of the networks. Sony is planning to make live Major League Baseball games available for streaming on the Playstation 3. According to a Nielsen study, online video ads generate superior brand recall and likeability figures versus TV ads. In response to a threat from a radical Islamic website, the latest South Park episode censored the mentions of Muhammad, though whether it was all done as satire or some as capitulation is not clear. Sounds more like capitulation, given that the offending episodes will not be available online. UPDATE: Parker and Stone have released a statement claiming that all of the bleeping was Comedy Central's doing: "In the 14 years we've been doing South Park we have never done a show that we couldn't stand behind. We delivered our version of the show to Comedy Central and they made a determination to alter the episode. It wasn't some meta-joke on our part. Comedy Central added the bleeps. In fact, Kyle's customary final speech was about intimidation and fear. It didn't mention Muhammad at all but it got bleeped too. We'll be back next week with a whole new show about something completely different and we'll see what happens to it." Scott Collins and Matea Gold report on the precedent being set here. Dave Itzkoff also reports. SyFy gives us a look at a day in the life of script coordinator John Herrera. The long-rumored Hulu plan to start charging us is apparently a reality; Hulu will begin testing a $9.95/month plan for access to anything beyond most recent episodes. Peter Kafka's response to this scheme. Kyle Brady questions what this means once Comcast takes over NBCU and calls for Net Neutrality. NewTeevee solicits and showcases reactions. Willa Paskin asks, does last night's Madonna-centric Glee episode constitute product placement? Enjoying his final weeks at The Wrap (he's leaving for New York Vulture), Josef Adalian reports on Angela Bromstad's good mood. Georg Szalai reports on a new study about the per viewer economic value of broadcast and cable networks, which could have an impact on retransmission and carriage fee fights: "The average TV network makes about $1,450 per viewer per year in affiliate fee revenue, with cable channels with sports programming outperforming the average, while pure-play cable TV companies likes Scripps Networks are "under-earning," according to a new report." Very important dollar figures here. The New York Times' Brian Stelter has reported on a rumor that Donny Deutch has been pulled from MSNBC due to criticism of Keith Olbermann and at Olbermann's direction. Olbermann tweeted response to this article: "This just in: complete fail by @BrianStelter of NY Times. I advised him of how wrong he was and he still posted...I emailed @BrianStelter "Your account is entirely untrue. Your email is the first I am hearing of any of this. What I know of what is this: (MSNBC President) phoned me yesterday enraged at what was on that show + I didn't disagree with him"...Sad to say, @BrianStelter was an innovative and hardworking blogger. He's in over his head where he is now." Has good TV drama killed off film drama? There could soon be an Xbox-only TV channel. Cartoon Network's upfront presentation unveiled news of new shows, including a new version of Looney Tunes. Also, like Animal Planet turning to more shows about people, Cartoon Network will now have more shows about sports. Cartoons, sports...it's all the same in the end. UPDATE: Steve Sternberg's 10-year-old son (really!) offers his assessment of the Cartoon Network presentation, which includes a big thumbs up for the planned sports and live action shows. Looks like Cartoon Network knows what it's doing to attract the demographic it wants. And Jaime Weinman blogs about the Looney Tunes news. Tuesday night's fast nationals: Fox rolled behind Idol and Glee; Parenthood was up and Lost was down. OWN, Oprah Winfrey's cable channel, has its first advertiser: Procter & Gamble. Lane Bryant accuses ABC of censorship for not airing a lingerie ad. Jon Friedman considers the possibility of Disney dumping ABC. The Food Network has spun off a new outlet, the Cooking Channel, which Allen Salkin reports features "low-key programs targeted at a hipper crowd interested in the grass roots of food culture." New Jersey is the hot new spot for reality TV production, while Greenpoint, Brooklyn has become a scripted TV and film production center. The Wrap considers what it took to make last night's Madonna-centric episode of Glee in terms of music rights. TV writer and blogger extraordinaire Ken Levine has a great post on the process of plotting out stories for M*A*S*H, a show he worked on a number of years. Sony and Discovery are working on better 3D production equipment for documentaries, but Ryan Lawler reports on a non-technological problem for 3D TV: people just might not care about it. The share of cable to broadcast viewership has settled in at about 60/40, which is actually viewed as good news for broadcasting, given that it's holding steady. As Alan Sepinwall summarizes, lots of programming news bits today: Parenthood and Curb Your Enthusiasm will be back, and Mad Men returns on July 25. Also, Rescue Me and the new Louis C.K. show Louie will start on FX on June 29. Monday night's fast nationals: Dancing With the Stars scores with the judges at home. In other ratings news, John King is not doing well for CNN. Today's web series actors could be tomorrow's TV stars. Local TV stations are reaping more online ad revenue this year. The census results may help boost Spanish-language television in Denver. The NHL and NBA are making deals to stream games on Boxee and Roku devices. ESPN is sharing 3D production tips with other producers. Kimberly Freeman Brown and Gabriel Thompson criticize Undercover Boss as corporate propaganda. LA newscasts do more battling before 6am than most of us do all day. With the Main Title Theme Music award being dumped by Emmy, Myles McNutt considers how its legacy will carry on in the Outstanding Main Title Design category and looks at this year's contenders. Kelsey Grammer is behind a new venture to launch a conservatively-minded cable channel called the Right Network, and over at Antenna, Jeffrey Jones warns us about the dangerous demagoguery of Glenn Beck. Cops has been renewed for a 23rd (!) season and will reach 800 episodes (!) soon. Do you have a new reality show airing on VH1 this year? If you're not sure, you might want to check. Seriously, they're planning a lot of new reality shows. Jon Stewart and Stephen Colbert will keep doing their thing at Comedy Central at least through the next presidential election. Chris Albrecht is making changes at Starz. (I have a suggestion. Do something about that z). YouTube is setting out to compete not with other internet video sites but with television. TV By the Numbers has been tracking each prime-time night's ratings in detail; here's their latest on Thursday nights, with ABC in the overall lead. The Academy of Television Arts & Sciences has made some changes to its Emmy Awards rules, most notably there will likely no longer be an award for Main Title Theme music. NBC is once again, only more so, celebrating Earth Week. At Antenna, Matt Hills writes about the return of Doctor Who, which set a BBC America viewership record. Jaime Weinman observes that, unlike film, ambitious television today typically presents itself as divorced from any ancestral influence. Sunday night's fast nationals: Country Music Awards rocks for CBS, though it was down from last year. TVNewser has cool pictures of the Shanghai TV newsroom, which looks like a lot like a newsroom over here. USA Network has extended its "characters welcome" programming initiative into advertising, forming an in-house creative agency to help sponsors develop appropriate characters for their ad campaigns and product brands. Joe Mandese reports on a survey of ad buyers that indicates that ad execs plan to increase ad spending for the 2010-11 season, and they plan to spend more on cable than broadcast advertising. ...and nothing on? Dish announces that they're the first pay-tv provider to reach 200 HD channels available. But Todd Spangler questions Dish's math. A bunch of Conan coverage this morning: from the New York Times, a consideration of the role of the youth demographic; from B&C, this is a win for syndicators, a sign of local TV clout, and a decision made by Excel spreadsheet, not talent consideration; from Wayne Friedman, this is a bold network switch; and from Steve Sternberg, this is not a surprise. AdAge offers a primer on what ad networks and exchanges are. AdAge reports on CNN's "program placement" plan, in which some of CNN's ad breaks will include a small bottom corner window offering a live view of the program during which they run. The Masked Scheduler raises concerns about Glee, or more so what will come along in its wake, in stressing the importance of networks truly trying to understand why a particular show becomes a hit, rather than just blindly trying to imitate it. VH1 is introducing a slew of new programs; Anthony Crupi reports: "The net will introduce 44 new series, each of which will align with one of three genres: music, celebrity and 'real life stories.'" Saturday night's overnights: For the first time in a few weeks, I remembered to post the Saturday night ratings, then upon seeing the numbers I was reminded of why I so often forget about them. The GLAAD (Gay and Lesbian Alliance Against Defamation) Media Awards were handed out last night, and TV winners included Glee and RuPaul's Drag Race. I've made my podcast debut, courtesy of Cory Barker and his Weekend Watchers series out of IU-Bloomington. We had a great (and, I warn you, long) conversation about the hottest TV topics, including Conan moving to TBS, our concerns about the storytelling in Glee, the joy and pain of watching Breaking Bad, our excitement about the potential in Treme, the challenges of keeping our interest in long-running series like HIMYM and The Office, and Modern Family, Parks & Rec, and Community grabbing us with their fresh approaches. Spoilers abound. Forbes highlights the Kardashians and other reality TV celebrities who have turned their lives into businesses. Aymar Jean Christian considers how MTV might translate the British hit Skins for the American screen. Moving Image Source's Chris Wisniewski discusses the technological and production challenges of the BBC documentary series Life. A Washington Post article on the recent Streamy Awards highlights a number of high-quality online series, calling this material "web television." Is this indeed TV or is a different name called for? Friday night's fast nationals: a backdoor pilot from NBC won the night. Brian Stelter reports on Fox News pulling Sean Hannity out of a Tea Party event. Get out your calendar, and maybe some spreadsheet software: Fancast has a complete list of season finales this spring. Lisa de Moraes speculates on why Dancing With the Stars is up and American Idol is down. With the NFL draft upcoming, TV By the Numbers has a fun game that's also instructive: if you ran a network, which prime-time scripted show would you choose as a first-round draft pick? Profits are way down at NBC Universal, but cable revenues are up slightly. Mediaweek's Alan Frutkin offers a video report on the mixing of music with TV. Les Moonves makes a lot of money. Omri Marcus wonders how much further television can push its sensationalistic content. Deadline's Nellie Andreeva has a list of pilots getting the best buzz right now. Futon Critic is the best source for getting more info about those shows in the coming weeks. Brian Stelter on the sitcom revival: "On studio lots, where dozens of new shows are being fretted about and fought over ahead of the networks’ scheduling decisions in May, the number of sitcoms in development has spiked. “I think we’re on the cusp of a bull market for comedy,” said Kevin Reilly, Fox’s entertainment chief, whose No. 1 priority for the fall is adding more live-action comedies to his schedule." Thursday night's fast nationals: CBS on top. FlashForward not. In the wake of job cuts, ratings at ABC News' three shows are all down. Marjie Killeen is pleased that Ellen DeGeneres has become a Covergirl model: "When a 52-year-old tomboyish lesbian is the freshest face in the cosmetics industry, something is going very right. In a world of airbrushed Brittanys and surgically altered Heidis, Covergirl’s campaign featuring quirky, funny and folksy comedian Ellen DeGeneres is a welcome relief." Will Brooker says the idea to make a sitcom based on Star Wars doesn't sound so bad after all. TV By the Numbers responds to NBC affiliates' pleasure over better post-Leno ratings at 10pm by pointing out how awful the ratings in all the other time slots are and wondering if there will be consequences for the affiliates once Comcast takes over. The head of India's Colors TV talks to Forbes about how it's beating out Rupert Murdoch's Star TV, with soaps as the secret weapon. Stephen Fry wishes British TV would take some lessons from American TV in terms of character development. A new study says that local news is on the increase despite a decline in employees. Very informative piece from Slate about what TV directors do. Jaime Weinman offers additional thoughts. Even if you hate Glee, it's worth checking out what this Glee app for the iPhone does. A brief look at how some shows have performed compared to last year. Media Life points out that many reality shows are seeing gains. The latest numbers on how many people have given up subscription TV for online alternatives. Wednesday night's fast nationals: I need a macro for "Idol won." The season finale of Human Target was down from past weeks, keeping it firmly on the bubble; Ugly Betty went out only slightly up. AdAge looks at Nielsen's new "fourth screen" report, measuring ads on TV networks outside the home at restaurants, retail stores, health clubs and the like. A documentarian hired by Lorne Michaels to chronicle SNL's history talks about his 2000s entry. British TV will soon host the country's very first televised political debates under a strict set of rules. UPDATE: The first debate drew the fourth largest audience of the year in Britain. MTV wants nothing to do with any of the rumored Jersey Shore spinoffs supposedly in the works. The early word on Sarah Palin's TLC show is not good. The game designer behind The Sims, Will Wright, has signed on to develop programming for the Science Channel. In related news, there's apparently a cable channel out there called the Science Channel. Josef Adalian praises Glee and Chevy's "Vogue" marketing. Daniel Frankel has a list of five reasons why 3D TV won't take off. Somehow one of them isn't the drinking warning. Salon's Rebecca Traister writes perceptively of the feminist backlash against Tina Fey. One of those feminists, Amanda Marcotte, responds. And Jaime Weinman chimes in. Pointing to Conan and TV Everywhere as examples, Joe Flint highlights the ways in which distribution still has some muscle despite the power of content. The Spanish-language networks are increasingly turning to so-called "infronts," or taking their presentations to top Hispanic markets, rather than upfronts. Picture what you think a Michael Bay-produced reality show would be like. Now read about it. Jaime Weinman writes about how sitcom tags operate and highlights (with clips!) a few unique examples from TV history. A team of analysts reports that CBS stands to gain the most from retrans fees. Sports look awesome in 3D, but now comes a warning from Samsung that you shouldn't drink and watch 3D TV. Therein lies a problem for American sports culture. Some sports execs talked about 3D today, but it doesn't appear they addressed this crucial issue. And it will have to be addressed. Steve Sternberg thinks broadcast and cable outlets would both be better off working together, rather than fighting. Ugly Betty leaves us tonight; Katherine Fung and Tanner Stransky reflect on why the show mattered. And David Hiltbrand considers where it went wrong. BET is planning to announce a new focus on scripted shows at its upfront presentation. Tuesday night's fast nationals: Glee returned to a series high audience; Parenthood didn't dip much; V hit a series low. Josef Adalian throws a bit of cold water on the Glee numbers. CNN fires back at critics and competitors by insisting that their non-partisan approach is best for news. TV Newser has some brief Fox News and MSNBC responses. And Jon Friedman shares some thoughts. More people want to see parodies of Tiger Woods' new Nike ad than the original. Mashable has a chart to illustrate it. Stuart Elliot reports on product placement within telenovelas. Actor Idris Elba calls on British TV to employ more diverse actors. Hulu is the #2 most popular online video viewing site, behind Google sites. A group of broadcasters have come together in a joint venture to develop a national mobile TV service. Will Richmond says this venture looks promising. Relatedly, FLO TV is developing new features. SyFy will air Friday Night Smackdown starting this fall. Yes, SyFy. Airing Friday Night Smackdown. SyFy's Craig Engler explains via Twitter: "We're always looking at the whole TV landscape to what would work best...Basically, sports are GREAT for TV...Sports bring younger viewers and drive live viewing, and they bring in a relatively broad audience, i.e. more new viewers...We ended up trying wrestling out because it has larger than life heroes and villains and "fantastical thrills" as we like to say...Wrestling has both a lot of overlap w/existing viewers and brings in new ones, so it's a great way to showcase our other programs." Meanwhile, Smackdown's former home, MyNetworkTV, will have to make do with Burn Notice instead. Especially with Glee coming back tonight, I could really use this for Tuesday nights: record 50 channels at once! Monday night's fast nationals: Dancing With the Stars impresses. 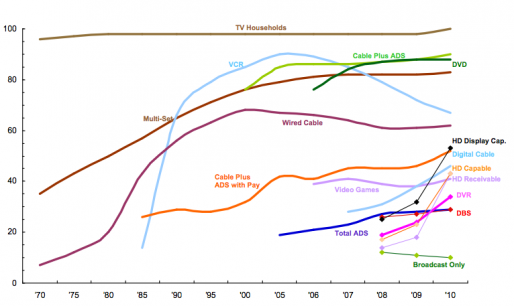 The overwhelming bulk of ad spending is still in broadcasting and cable over online. Brian Stelter writes about ABC's This Week, a Sunday public affairs program, turning to a fact-checking organization to literally keep its guests honest. Joe Flint on the TV industry battling the FCC over the broadcast spectrum: "Finding new sources of revenue is crucial, and broadcasters are counting on -- and jealously guarding -- their slice of the public airwaves as the conduit for that future revenue via new channels and services. Any loss of that spectrum, they fear, would cost them potential income." And now Flint has reported on FCC Chairman Julius Genachowski's response to broadcaster's concerns. Patrick Goldstein says Date Night teaches us that TV is better than movies right now: "But why? Is it TV that has stepped up its game? Or is it Hollywood that gotten into the habit of stooping to conquer? Actually, I'd argue that it's both." So much for being close on that Fox deal: Conan's going to TBS. Bill Carter reports on how the deal happened; Joe Flint also reports; Kim Masters talks with Conan's manager; Linda Holmes speculates on what's next; Alan Sepinwall says it's the right move for Conan; Rick Porter says it makes sense; Brian Steinberg says this shows the strength of the cable model; Fox affiliates are reportedly relieved; David Poland praises Conan's spin machine; this could boost Time Warner's profitability; Conan could have gone to FX; Fox could have had him if they really wanted him. TBS has the first promo. More links on this at tvtattle.com.